This brochure template cover proves that you can create something truly amazing with the right combination of a great photo and the ideal font. It’s perfect for modern business, startup, or a creative agency brochure. The template itself includes this cover and a total of 16 unique page designs, which you can easily customize using Adobe InDesign. It also features image placeholders, allowing you to place your own photos on the cover with just a few clicks. This beautifully minimalist brochure cover is the perfect example of a clean and simple cover design. It has a unique design and provides enough space for you to describe your business or company. The template comes in A5 size and it includes 18 different page designs. You can download and customize this template to fit your brand. Most companies use dull and outdated designs for its annual report brochures. Annual report brochures don’t have to be boring. When you use a clean and simple design like this template cover, your annual report will certainly stand out from the crowd. This template also comes in both A4 and US Letter sizes. It includes a total of 44 page designs and you can customize it using InDesign CS4 or higher. Crafting a brochure cover for a fashion and beauty brands requires extra effort. It has to be simply elegant and stylish at the same time. However, you can’t wrong with a beautiful brochure template cover like this one. This template includes a stylish cover as well as 16 inner page designs with image placeholders, paragraph styles, and more. It’s available in A4 size. 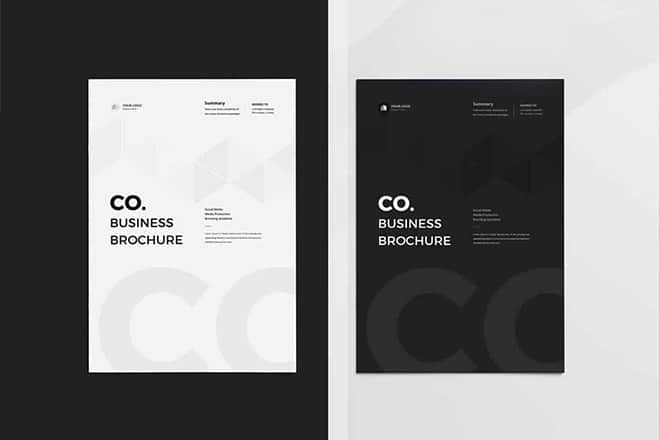 With this creative brochure template, you’ll be able to not only design an elegant cover for your business and company proposal brochures but also easily design its inner pages with a professional look and feel. The template comes with 22 custom page designs in A4 and US Letter sizes. As a bonus, the template bundle also comes with invoice, letterhead, flyer, and business card templates as well. If you’re a fan of minimalism, this brochure cover design will help you find inspiration for your own brochure design. This template comes in both light and dark color designs with a stylishly clean look. The template is available in A4 size and it’s fully customizable with InDesign CS4 and higher. The best way to show off your creativity is to keep things simple. This brochure cover design is the perfect example that shows how to craft an attractive and minimal cover for a creative agency brochure. The template itself comes with 24 page designs for creating a catalog of your creative agency portfolio. It’s available in A4 size and you can edit it with InDesign CS4. Adding a little bit of color with stylish geometric shapes is another great way to make a brochure cover that’s more attractive. This particular brochure cover design features a similar design, making it a great choice for creative agencies and brands. The template comes with 26 pages with a fully layered design for easily customizing the template however you like. When designing a brochure for showcasing a business or company profile, it needs to feature an elegant cover that represents the core values of the company and brand. This brochure template cover comes with the perfect design to craft a professional brochure for any company profile. The template also includes 24 page designs with fully layered and customizable layouts. It’s available in both A4 and US Letter sizes. Going with a landscape layout is the perfect choice for crafting a portfolio brochure for an architecture firm or agency. This brochure template comes with a landscape design and a cover that helps showcase your firm better. The template includes 12 pages with lots of space for showcasing your catalog with page layouts featuring minimal designs. Working on a brochure design for an interior design product catalog? Then you should use a minimal cover for the brochure design. Use a simple and clean cover design, just like the cover that comes with this template. It’s simple, yet tells a lot about the quality of design. The template also comes with 12 page designs in A5 size. When creating brochures for business reports such as sales reports, marketing reports, or projection reports, it’s always best to use a simple and clean cover. This brochure template comes with a clean design that you can use with almost any type of brochure design. The template is available in US Letter and A4 size and it features 20 unique page designs that can be easily customized to your preference. Another creative and modern brochure cover design for crafting more attractive annual report brochures. This cover features an elegant design with a dark color theme. You can also easily customize this template to change its colors using InDesign CS4 or higher. Using geometric shapes in brochure cover design is nothing new. However, this cover uses a creative combination of shapes and style to make a perfect brochure cover. It’s perfect for creative agencies and businesses. The template comes with 18 unique and editable page layouts in A4 size. Another great example of using geometric shapes in brochure cover design. This cover also uses a set of shapes with image overlays to create a unique effect. The template comes with image placeholders to let you easily edit the design and place your own images. It also includes 12 custom page designs as well. Creative agencies usually go with minimal and a mixed design of image and shapes for brochure designs. This brochure template’s cover represents a combination of a beautiful and creative brochure cover design. The template also includes 20 page designs with editable colors, size, and elements. Using a dark color theme for your brochure design can also help highlight its content more easily. It’s also commonly used by luxury brands and businesses. This template is ideal for crafting that type of brochures. The template features 32 customizable pages with paragraph styles, image placeholders, and more in A4 and US Letter sizes.